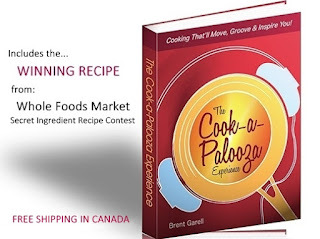 The Cook-a-Palooza Experience: Pineapple Carrot Muffins...Never Too Soon To Make Them! 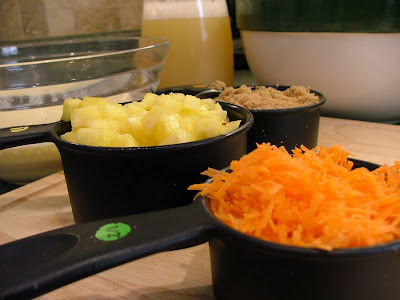 Pineapple Carrot Muffins...Never Too Soon To Make Them! Granola bars are often marketed as a nutritious snack. Unfortunately the ingredient list on the majority of them suggests otherwise. Fructose/glucose isn’t exactly high on the nutrition scale. During the week I often find myself stuck in the granola bar rut. I have a weakness for the ones covered in chocolate but I rarely feel guilty about it because I see it as a nutritious candy bar. How crazy is that? Those damn granola bar marketing people have somehow convinced my easily manipulated brain that their product is good for my health so I rationalize that it’s better than the candy bar. I need help! 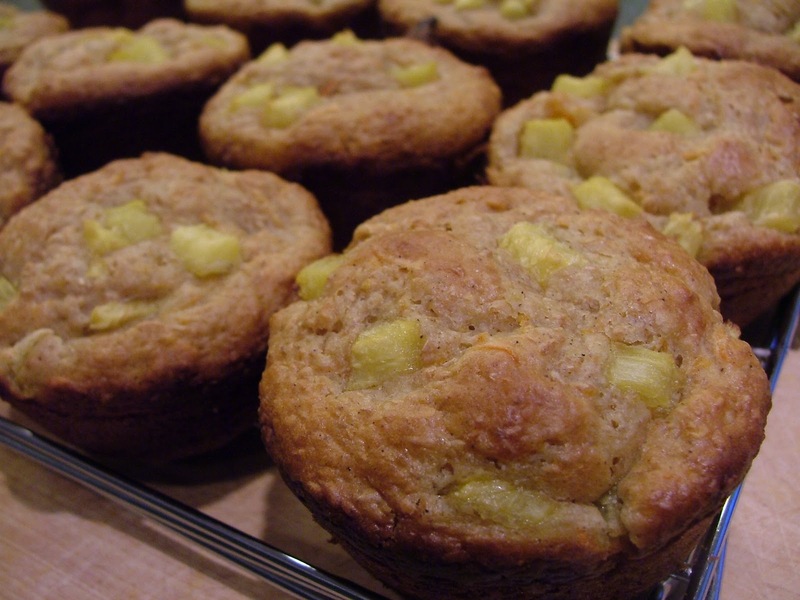 Thankfully I have taken steps to overt this type of foolish thinking by putting aside 30 minutes each weekend to prepare low-fat baked goods such as these Pineapple and Carrot Muffins. They have more flavor than a granola bar and are full of nutritious fiber thanks to the grated carrot and the wheat bran. What I love about baking is it’s relaxing. You never have to worry about things boiling over, spattering or catching on fire. All that’s required is some accurate measuring and some self discipline not mix everything to death. It’s very easy to get lost in your favorite music while baking. The song that provided an escape for me while making this dish was “How Soon is Now” by The Smiths. It came on the radio and I thought it was a perfect musical pairing for these muffins because when it comes to weaning yourself off granola bars and eating healthy home baked goods….you can never start soon enough! 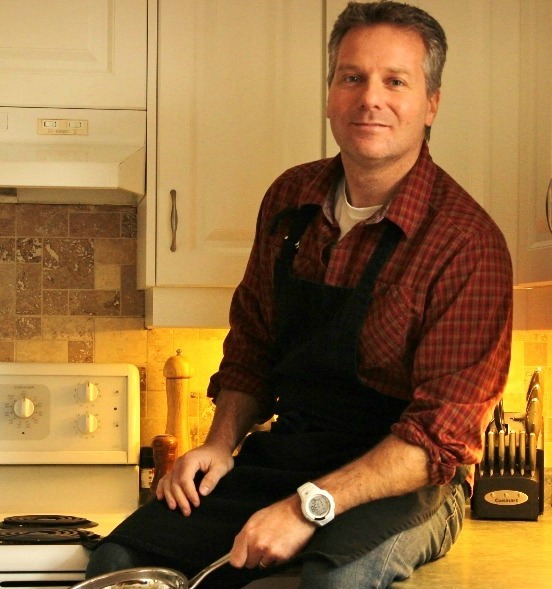 Have a baking question? Leave a comment or e-mail me. Maybe I can help. Spray a 12-cup standard-size muffin pan with non-stick spray. In a large bowl combine flour, wheat bran, baking powder, allspice, baking soda and salt. Set aside. 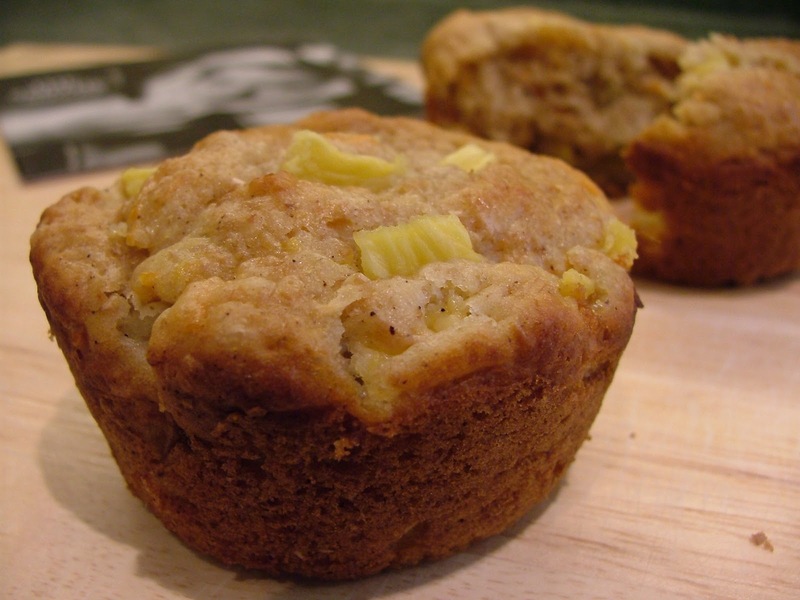 Bake in a 350º F oven for 18 to 20 minutes or until a toothpick inserted in center of a muffin comes out clean. Remove muffins from pan and let cool on a wire rack.